Oh No, Square Enix, What Have You Done To Final Fantasy VI? 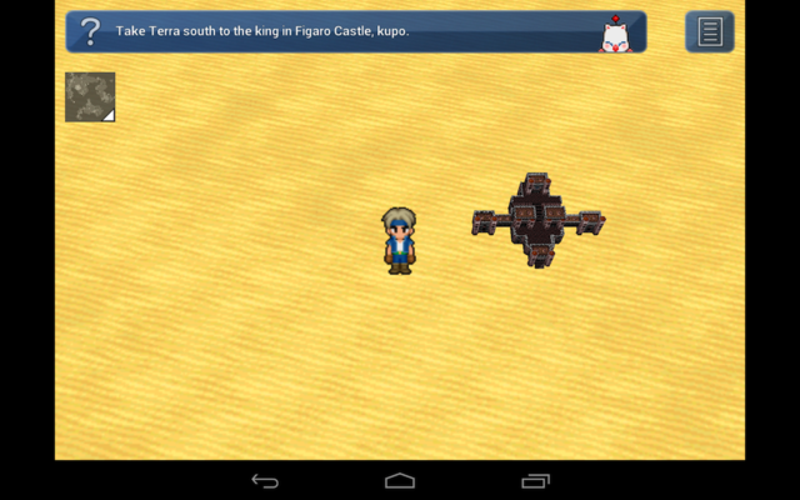 When we first saw screens of Final Fantasy VI on mobile, I was a little worried. The sprites looked faded, as if they'd been accidentally thrown in a washing machine, and like the FFV port before it, the game had an amateur, RPG Makerish feel. But who knew it would get this bad? Today Square released the Android version of the FFVI remake/port, and one Redditor has been posting screenshots and impressions throughout the day. While some of the new features seem pretty neat—like Sabin's Blitz feature on touch screen—the aesthetics are killing me. One of my favorite games now hurts to look at. This is an atrocity against my childhood. I mean, look at that city in the screenshot above. They shrank a realistic-looking model of Figaro and slapped in on the world map, even though it looks nothing like the cartoony, washed-out Locke sprite standing next to it. The dimensions might be askew, but at least everything fits. Locke seems like he belongs. Figaro Castle's world map landmark is an abstraction, but it feels like part of the world. It doesn't look like someone's half-assed sticker. Sigh. These characters, once so interesting and animated, now look like they were drawn in MS Paint. And sure, we can ignore this mobile remake. We can pretend it doesn't exist. But it does, and it's painful to see that in 2014, this is how Square Enix treats one of its most beloved games. At least we'll always have the SNES version, my friends. They can never take that one away from us.